The HSU Department of Music presents the Arcata Bay String Quartet for a Sunday afternoon Faculty Artist Series concert featuring three masterpieces for the string quartet on March 31, at 2 p.m. in Fulkerson Recital Hall. The Arcata Bay String QuartetThe iconic works by Franz Joseph Haydn, Robert Schumann, and Claude Debussy will be contrasted with a short work composed by American singer-songwriter and founder of the Grammy Award-winning Carolina Chocolate Drops, Rhiannon Giddens. The evocative setting of Giddens’ original song “At the Purchaser’s Option” was inspired by a slave auction sale bill, and composed for the Kronos Quartet’s “Fifty for the Future” project. 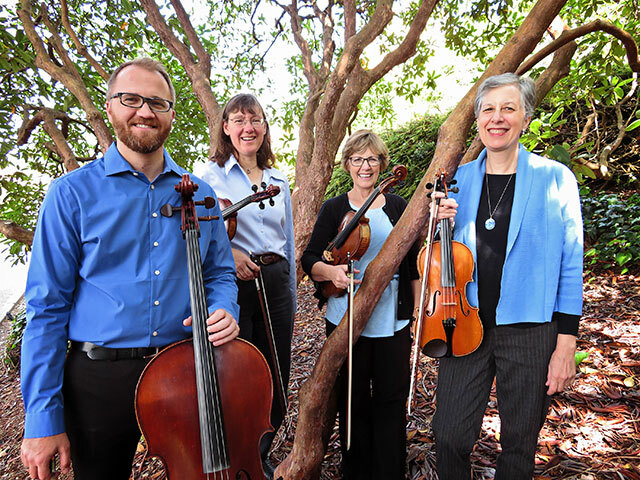 The Arcata Bay String Quartet was founded in 2017 by HSU music faculty violinists Cindy Moyer and Karen Davy, community violist Sherry Hanson, and faculty cellist Garrick Woods. Since then they have been achieving the dual goals of exploring favorite works from the repertoire and performing them for eager audiences in Humboldt County and the surrounding region, including a recent concert in Redding. The first work on the program, String Quartet in G, Op. 76, No. 1, is from the last group of quartets by Haydn, who practically invented the string quartet form in his early years as a composer of chamber music. The piece is classical in style and form, but also full of drama, and provides lots of exciting playing for each member of the ensemble. The String Quartet in a minor, Op. 41, No. 1 by Schumann is dramatic with a lighthearted, exciting Scherzo and a virtuosic last movement that includes hints of country fiddle music. Schumann composed the entire work in just four days, in June of 1842. The String Quartet in G minor, Op. 10 by Debussy is the final quartet on the program, and the most “modern” one. Called “Impressionist” in style, it relates more to the late 19th century Symbolist poets than to the Impressionist painters of the same era, but the thrilling sweep of textures and tonal colors will sound just as familiar to the audience’s ears as the classical and romantic works do. “The Debussy is one of the greatest of all string quartets, and we are extremely excited to be playing it,” says HSU Professor of Music and ABSQ co-founder Cindy Moyer. Giddens is well-known as an eclectic old-time musician, singer-songwriter, and multi-instrumentalist from the Piedmont region of the Carolinas, but she also studied opera at Oberlin Conservatory and continues to find new ways to blend gospel, blues, Celtic, and country music traditions unapologetically with the realities of the African-American experience. The addition to the program of Giddens’ new work, At the Purchaser’s Option and Variations, puts the Arcata Bay String Quartet in the exciting position of helping new music, and the emerging, diverse artists composing it, find a home and an audience in the concert hall of the 21st century. The performance takes place on March 31, at 2 p.m. in Fulkerson Recital Hall. Tickets are $15 general, $5 child, $5 HSU students with ID. Call 707.826.3928 or visit the Center Arts website for tickets.